Motorcycles have been around a long time and one of the most often used features of a motorcycle is a two-stroke engine. This smaller engine build fits between your legs so that you can straddle the bike and head out on the road. Soichiro Honda, the founder of Honda, didn’t like two-stroke engines at all. Instead, Honda developed small four-stroke four-cylinder engines that have been a staple of the Honda brand of motorcycles for many years. Knowing they had developed car engines for motorcycles, Honda decided to attempt to turn the page and work on models that had four wheels for the drive. The first Honda vehicle was one that came powered by a 360cc twin-cam four-cylinder engine that produced about 30 horsepower. This engine revved up to nearly 9000 rpm to power a tiny truck that was made to get the job done on the roads in Japan. As weird as it sounds to have a truck powered by a motorcycle engine, this 30 horsepower was nearly twice as much as what the Subaru 360cc motor produced in its twin-cylinder two-stroke setup that was used its brand of motorcycles at the time. The fact that Soichiro Honda wanted engines that reflected cars instead of following the crowd of motorcycles was ingenious and made it easier for Honda to develop the engines needed for vehicles with four wheels. Even though we saw the T360 pickup truck as the first four-wheel model from this brand, it was the beginning of something special. 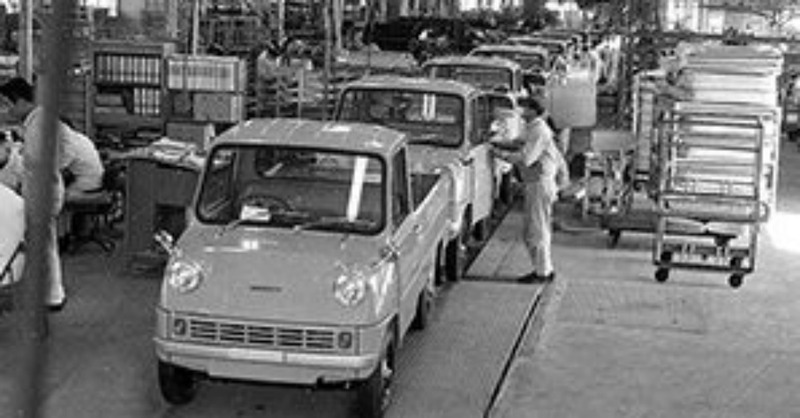 Honda was part of the movement East from Japan to bring small and efficient vehicles to the US and ever since the first model came across the Pacific, Honda has never left and has become one of the most popular brands on the market that we enjoy driving on a daily basis. While the successful model, which you see in the video below, was the T360, this small engine was originally developed for a roadster sports car. Imagine a small Honda sports car with two seats, a tiny engine and the fun you want. Unfortunately, the T360 never made it to the market but was later launched with a 500cc engine as the S500. It would have been interesting to see the T360 make it to market, but we can’t complain about the choice to have more power offered for the sports car that was developed. The T360 wasn’t just an odd vehicle, it had a mid-engine setup to free up space in the passenger area and allow for much greater cargo capacity. The look and build of the T360 may have been a bit bizarre, but that was pretty much what we expected from Honda in the early days. Check out this video that was the promotional marketing for the T360 when it was first developed. The video is just as odd and interesting as the vehicle itself that was the subject and the way work would get done.